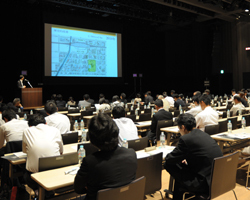 ﻿ Joint research with Universities｜SRD HOLDINGS Ltd.｜SAKAMOTO INDUSTRY CO.,LTD. Fundamental research resolutely facing the future. To remain at the forefront of the industry and to grasp the initiative in the competition for future technology development, SAKAMOTO INDUSTRY has joined forces with laboratories at Teikyo University, Chuo University, Gunma University to challenge the technologies of the future. For example, on-going joint-research into topics related to exhaust systems, such as "Visualization of Exhaust Gas Flows" and "Numerical Predictions of Flow Noise," with the aim of presenting papers to academic conferences. This research should create technologies leading to the development of new products or even revolutionary technologies with the impact to transform our car societies five or ten years in the future. Not just staff, but researchers. Our company takes a positive attitude to research and development activities to contribute to society through technical innovation. Every person in every department has an individual "research topic" in addition to his or her own work. 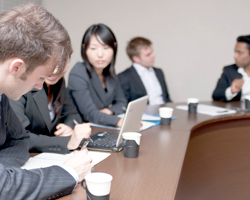 The company holds a results presentation once a year for the staff members to present the results of their own research. Our motto is to remain as engineers who make their own way without following in anyone else's footsteps.